"There is an interesting but annoying issue with Alfresco document links. It is way too long and it looks particularly terrible in email messages... One quick solutions is to use the services to provide by vendors like TinyURL*. But is that really necessary? The answer is no. How about writing a simple webscript and assign it a short URL with a short unique ID?" This isn't just a problem with Alfresco - just about every Web-based enterprise system suffers from this problem. I just wonder why none of them come bundled with an enterprise short URL service as standard? I suspect part of the problem is a myopic assumption that users act as individuals and will browse the application to find the information or function they want. Of course, we really know that information is social. *TinyURL is one of a number of web services that provides short aliases to redirect long URLs. Traffic unrules - can we apply these patterns to enterprise IT? "In the city center, all conventional traffic signals have been taken out and the traffic is no longer regulated by traffic signs - people do the regulating themselves. And that is the whole idea, namely that the road users, pedestrians and motorists alike, should take each other into account and return to their everyday good manners." In the SMH, they report that the initiative has reduced the accidents and it also saves money by removing the cost of maintaining road signs and traffic signals. This approach to "negotiated behaviour" in the urban environment - termed Shared Spaces - was championed by Dutch road traffic engineer, Hans Monderman, who unfortunately passed away at the beginning of this year. "The common thread in the new approach to traffic engineering is a recognition that the way you build a road affects far more than the movement of vehicles. It determines how drivers behave on it, whether pedestrians feel safe to walk alongside it, what kinds of businesses and housing spring up along it." I would say the same applies to IT and I wonder if we can interpret these Shared Spaces patterns in an enterprise context? Remove signs: The architecture of the road - not signs and signals - dictates traffic flow. Install art: The height of the fountain indicates how congested the intersection is. Share the spotlight: Lights illuminate not only the roadbed, but also the pedestrian areas. Do it in the road: Cafes extend to the edge of the street, further emphasizing the idea of shared space. See eye to eye: Right-of-way is negotiated by human interaction, rather than commonly ignored signs. Eliminate curbs: Instead of a raised curb, sidewalks are denoted by texture and color. Hat tip to David W.
After hearing about a record breaking 105 year old light bulb from Kim, this short piece about the demise of the incandescent light bulb by Alice Rawsthorne, which was republished in this weekend's SMH Good Weekend, caught my attention. All around the world, incandescent bulb are being phased out by new energy efficient lighting technologies, like compact fluorescent bulbs and LEDs. Today we wouldn't think much about the impact of an everyday technology like electric lighting, but as Rawsthorne explains that the incandescent light bulb "wasn’t the only reason why pioneering Modernist architects like Le Corbusier and Mies van der Rohe introduced a new style of lighter, brighter interiors in the early 20th century, but it was a big one. Until then, most rooms were painted in dark colors to disguise the stains of oil and gas lamps." Rawsthorne has a problem with energy efficient lighting because it is "cold and flat". I couldn't agree more with her. I've also found that compact fluorescent bulbs can also play havoc with some equipment that uses infrared, like the portable keyboard for my Palm TX. I wonder how we will change our home living environments to respond to this change, afterall who wants to live in a space that feels like the workplace? Another reminder that apparently simply technology changes can have widespread impacts. Question: How do you decide what content goes on intranet and what content goes on a Document Management System. Is it an issue in your organization? My Answer: Ideally we wouldn’t need to worry if content is part of the intranet, document management system or any other kind of information management system – storage, transformation and consumption of information would be separated so that ultimately information could be used where ever it is needed. However, the reality for most organisations today is that “enterprise content management” is still something they are moving towards, which is where deciding where to store what becomes a challenge. The information management maturity in your organisation will to a degree determine the balance between elegance (i.e. ECM) and practicality. If you are leaning towards practicality, then I would suggest you identify the most critical information for storage on in your DMS so you can take advantage of features like integration with desktop tools, advanced security, versioning, audit trails and workflow etc. However, as has been pointed out, you may find that you have a WCMS that actually has adequate DM functionality to suit your purposes. BTW If you are actually going to use your WCMS for Record Management purposes, then make sure it is actually compliant with record keeping regulations in your jurisdiction. Another tip, if you do find yourself using multiple systems to store information (e.g. DMS, intranet, Web-based project tools) your users will really appreciate clear guidance on what tool they should use to store what. In this situation, enterprise search is also a really helpful feature for end users to help them discover content from different sources. "In shipping, it takes master engineers around eight years to reach the pinnacle of their profession. They tend to be contemptuous of ship captains, taking the view that captains are merely the people who stare out the front of a ship that wouldn’t go anywhere without engineers. They rarely share information except on a ‘need to know’ basis. Wallem had information stored across multiple systems both packaged and in-house built applications. While systems could ‘talk’ to one another, there was no real way for anyone to obtain a complete operational picture. Wallem’s solution was to implement Attensa’s RSS solution to expose and organize data that is then dropped into a corporate blog." "The advantage of using a feed server for this is that it provides complete device/platform independence for consuming the event feed, as well as providing multiple formats for consumption. An enterprise RSS feed server provides things such as integrating your LDAP database for defining users and groups, and allows for easy assignment of specific feeds to users and groups." Also, while we're talking about Enterprise RSS, check out this post from Martin. UPDATE 2: More from Scott over at Attensa about this case study, including slides. "At about 11:00 AM, Linden, Ruth arrived on an OpenSim server, quite quietly. and to her surprise. We had been testing some code, and I’d asked Layla Linden to try to log on again, to see how the bug looked on the client side. But.. the latest fix, put on moments earlier, was, in fact, the last one we needed. I logged in as well, and several other folks from Linden lab joined us. Here we have Me, Layla Linden and Tess Linden. What’s to unusual about logging into OpenSim? Nothing. But.. this wasn’t a normal login. 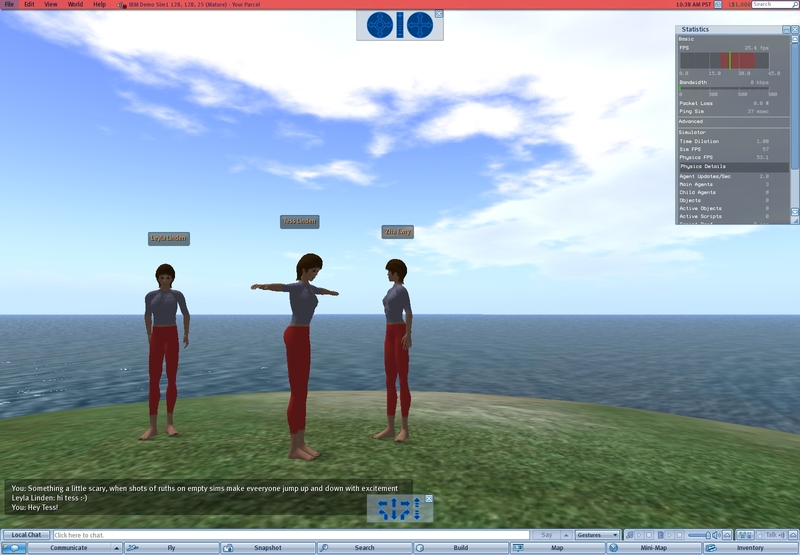 All three Avatars had been logged on via the Agent Domain in the Linden Lab Aditi test grid. The Agent Domain took a “place_avatar” request from the client, and issued a “rez_avatar” request to the OpenSim, which handed the Agent Domain the necessary details so it could relay it to the client, and permit a login. We’re all Ruth, because we’re not yet syncing the agents with openSim inventory yet. That’s just a small matter of programming… (Well, that’s what we programmers always say.) We have no inventory, and we’re stuck on the single region. But.. It’s a very nice first step." BTW The title of this blog post was taken from a comment, by Rez Tone. Do Enterprise 2.0 technologist have something to learn from the sociologists? "Fligstein's argument is that the actors in markets seek stability in those markets so that firms can survive and make profits without too much angst. He says no actor can know which behaviours will maximise profits - either in advance or in retrospect - so action is therefore directed towards the creation of stable worlds. There are two potential sources of instability they have to guard against: the tendency of firms to undercut one another's prices and the problem of keeping the firm together as a political coalition." When we wonder why Enterprise 2.0 and other Web 2.0 technologies (and even other disruptive technologies before that) aren't making as much traction inside organisations as we might like, is it because we assume these organisations want to do better when really all the managers want to do is survive, and all without too much angst? I'm in sunny Perth all this week (for a client project) but since this is only my second trip here and I don't know when I'll be back next, I wanted to grab the chance to connect up with the local knowledge management community. Thanks to both the new Perth Knowledge Management & Innovation Forum and Dopplr, we organised an informal chat session featuring myself and also Nerida Hart (from Land & Water Australia) who is in town at the same time. We'll be talking about everything from Enterprise 2.0 to knowledge transfer to what's happening in different industries. As part of this, I think Nerida will be talking about her Regional Knowledge Resource Kit wiki. If you're around the Perth area tomorrow night (Thursday), meet us all at the Brass Monkey pub at 6pm. BTW Let me know if you would like to be connected with the Perth Knowledge Management & Innovation Forum, being facilitated by Simon Haigh at Minter Ellison.